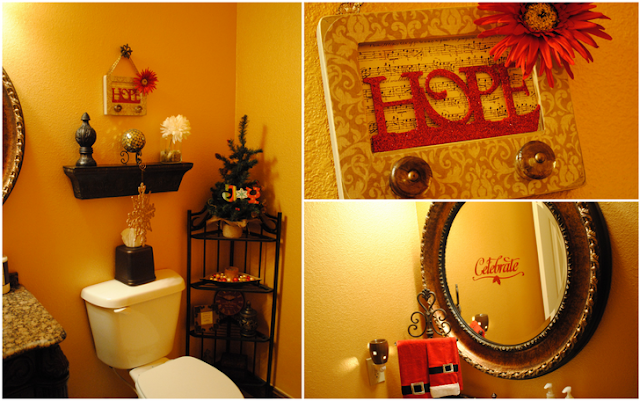 Thank you guys so much for all of the sweet compliments on my first part of the Christmas Home Tour. Even though it was a lot of work, we really enjoyed doing it and it was great to help with a community fundraiser. Now for the rest of the tour! For the master bedroom, we went with this Pottery Barn inspired look of wrapping greenery around our bed posts. Thrifty Decor Chick did this last year and also used some lanterns, so we came up with something similar by wiring some votive holders from Dollar Tree and placing LED votives in them. I just LOVE the way it turned out...so warm & cozy! 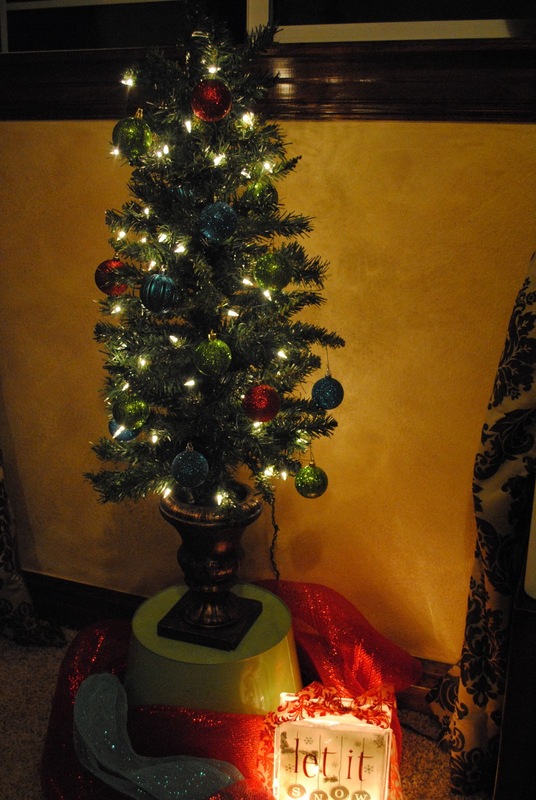 We also have a small table-top tree that my mom flocked and it turned out so cute. For our bathroom, we thought it'd be fun to do some floating candles and rose petals in the tub. Everybody loved it! I used my Cricut to cut out "Wise Men Still Seek Him" and put that on our mirrors. We also put some fresh greenery in the chandelier and between the sinks. The powder room is the other bathroom downstairs. 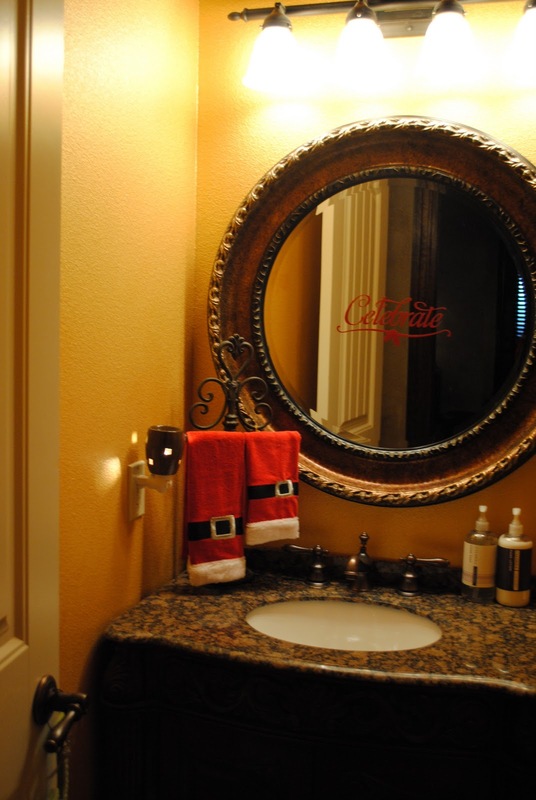 We put some vinyl on the mirror and a few other decorations as well. Now let's head out to the back veranda. It is incredibly windy where we live, but we still put a few decorations out and fortunately most of it stayed put that day. Now let's go back inside and head upstairs - almost done! First up is the guest room. 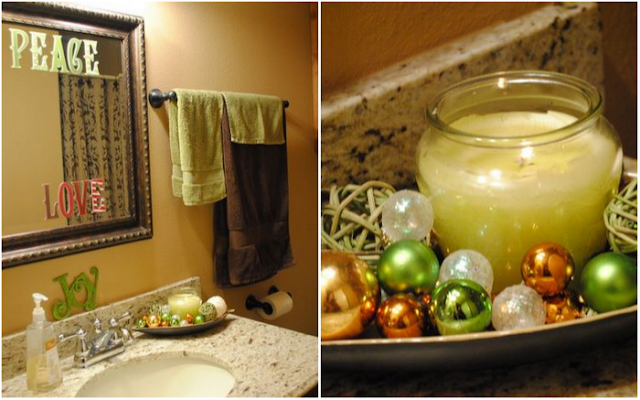 We put tons of little trees on top of the dresser, as well as a few candles, and then hung ornaments from the mirror. We also draped a NOEL banner (cut with my Cricut) across the window. This room has a small bathroom in it. 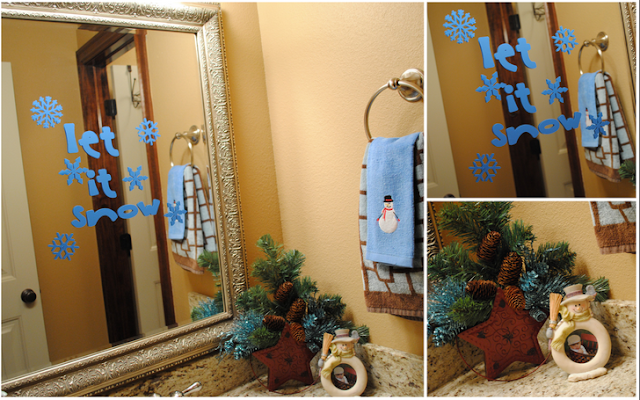 For it, I just put some decorative stickers on the mirror and added some ornaments around a candle. 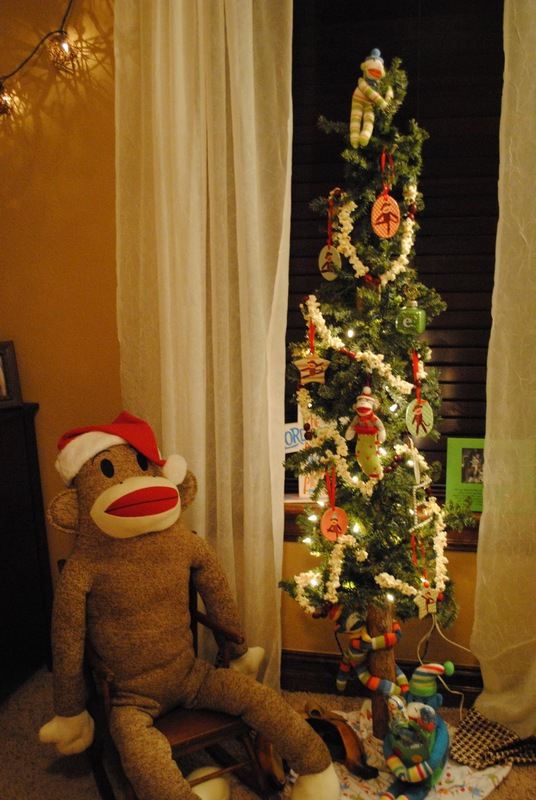 For Manny's room, we used a cute little rustic Christmas tree decorated with sock monkey ornaments (surprise!) and popcorn strands...kind of a vintage feel. 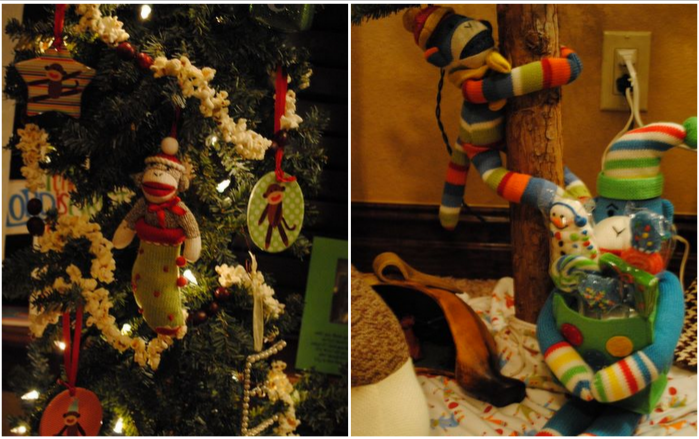 I designed the sock monkey ornaments then had them printed at Arts Cow. I was also able to pick up a few other fun sock monkey decorations thanks to some of you sweet readers that gave me the heads-up on products you'd seen. Manny's bathroom is part of a jack and jill bathroom. Here is the vanity on his side. 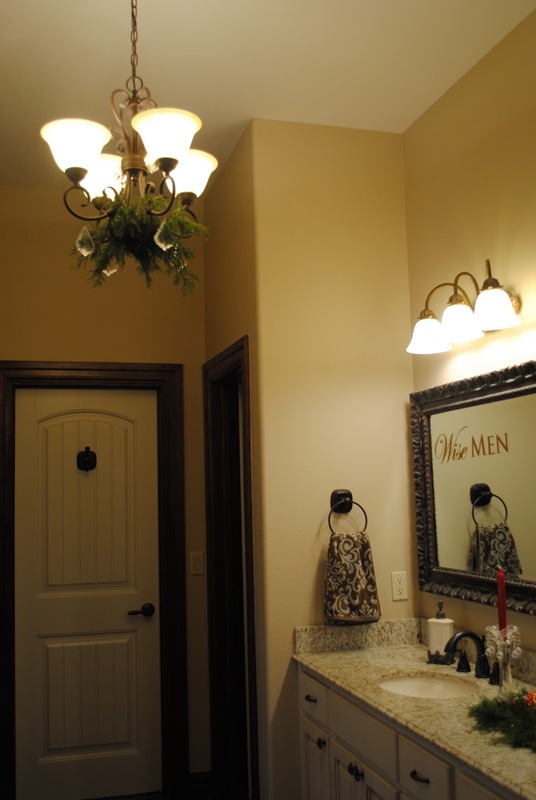 The bathroom connects to the office/etc. room. Here is the vanity on that side. And finally, the office/etc. room. 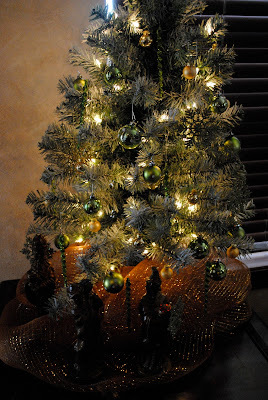 I shared the details about most of the decorations in this post. We also hung some ornaments from the window and put a small tree up. I love the color palette in this room of the red, turquoise, and green. Thanks for visiting my place too! Wow! Your house is so beautiful! Can you come decorate my house next year??? Your home...one word...STUNNING!!!! Absolutely GORGEOUS!!!! How beautiful; you have a gorgeous home! Hope you and your family have a very Merry Christmas! Ummm Okay...you are putting us all to shame! Looks like a magazine! You should get paid to do that! Amazing! Merry Christmas! 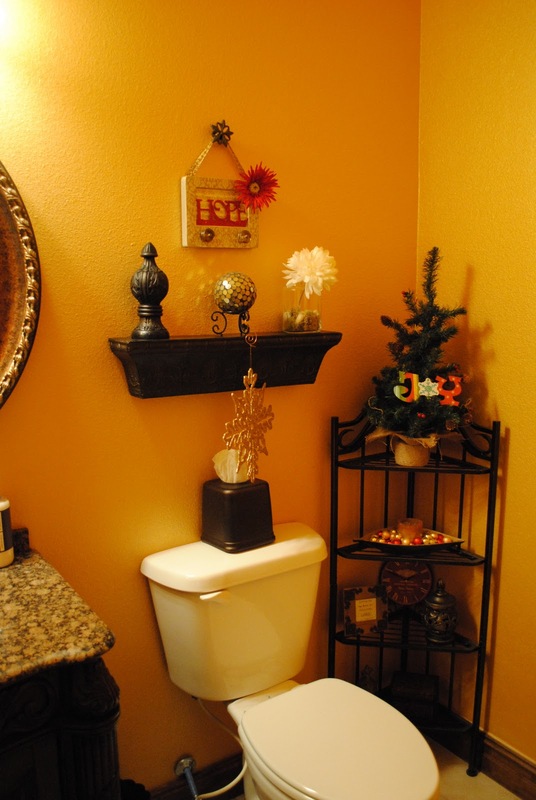 Your home and your decorations are just fabulous! I am impressed...I don't think I'd have energy to do all of that with a baby (mine is just a few weeks younger than Manny)! Beautiful home! Beautiful!!! I love decorating, and you had some new ideas for me! Love the ornaments hanging on the mirror and from the window. And I LOVE Manny's sock monkey tree! Cute! Stunning!! You can tell how much thought and detail you put into it. I can't even imagine how long it took you to knock that all out. 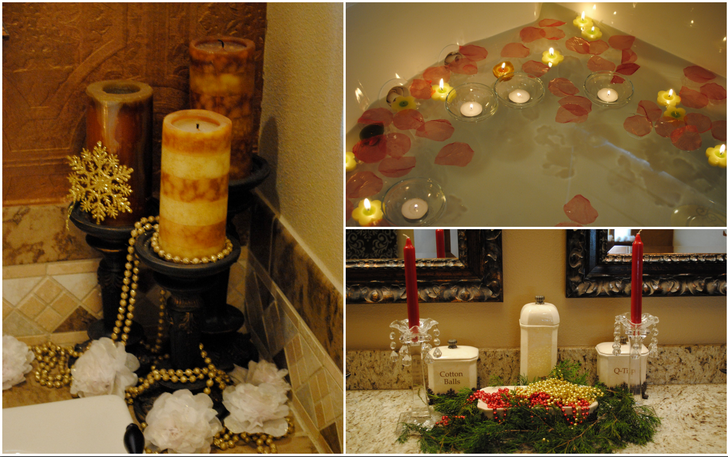 Those votive candles are so romantic, and my favorite is the vinyls you put on the bathroom mirror. Great job! Your home is absolutely beautiful! I love Christmas and I would have a hard time taking all of your beautiful work down after the first of the year! It's absolutely gorgeous and your veranda is amazing. 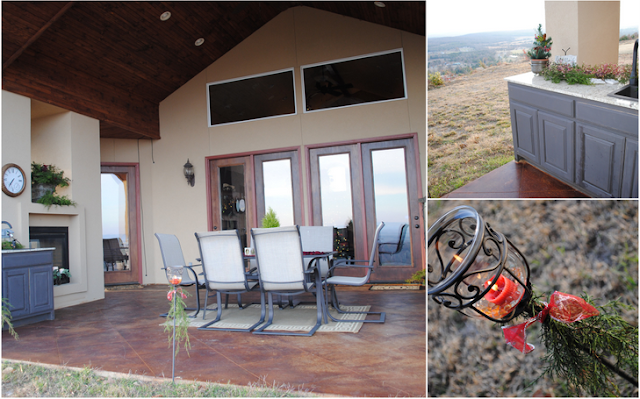 Outdoor spaces are my favorite and I find myself wanting to grill with you, Patrick and Manny. :) Lucky for you I'm in Georgia! Merry Christmas! WOW!!! Just when I thought it couldn't be more beautiful - it is! Absolutely stunning - looks like it came straight out of a magazine shoot! 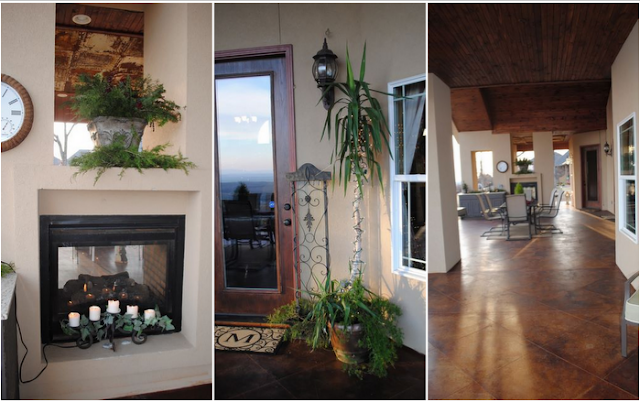 What a beautiful home you have - and those views are amazing! Thanks for sharing! :) Merry christmas!!! Sarah it's all GORGEOUS!! The view from the veranda is amazing. I love the candle thingy in the ground. Don't you love my descriptions?! HA! Um MTV just called. They are looking to show your home on the next season of "Cribs". Love it all. I thought you were kidding about the cranberries and popcorn. Wow!! The hours spent on this amazing job well done really shows. You have such a beautiful home!! Thanks for sharing all the lovely photos. And thanks for dropping by my blog - I actually just moved to a new domain right after you left a comment! First of all I love your decorations but I can't close my mouth after seeing your gorgeous view!! BEAUTIFUL! That is stunning! I am crazy about your EXTERIOR of your home! Gorgeous! And the interior...wow wow wow is all I can say! Wow, you don't mess around with Christmas decorations...I LOVE it!!! Your home is beautiful and looks so warm & inviting! The sock monkey tree is just precious! 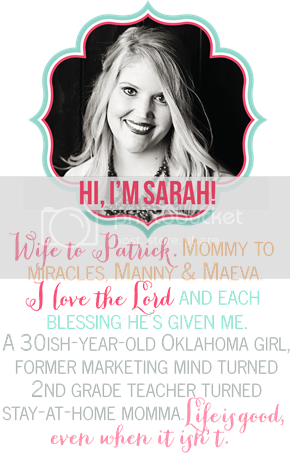 Love you blog, now following! So beautiful! I love it! And it's clear that I need to get a Cricut now! Wow. You have a gorgeous home. You also did a great job with your decorations! 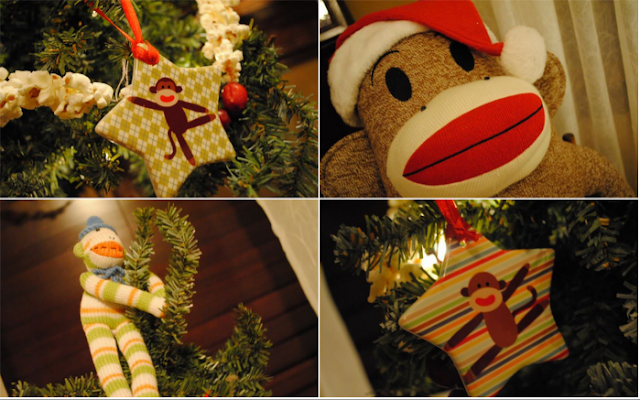 I love all the sock monkey stuf. your home is gorgeous sarah! i am jealous of all your space. i love the porch area! i love all your decorations, and i love that you did it on a budget! you would never know some of the items came from the dollar store or dollar general. i love great finds like that. Please come decorate my house! 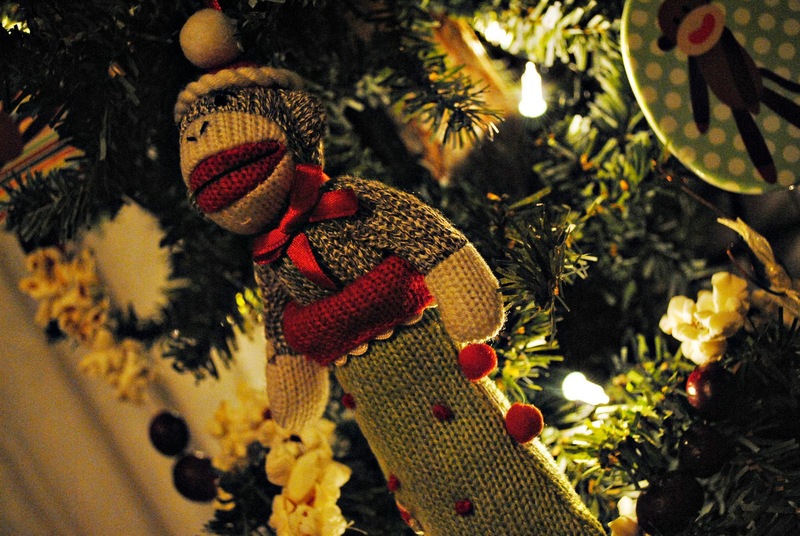 I love everything about yours especially the sock monkey tree!